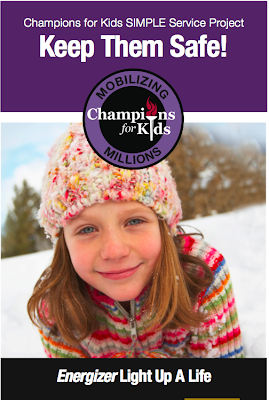 I am excited to be participating in the Energizer Champions for Kids Mission this week! Did you know that 70% of power outages in the United States are weather related? And that dangerous weather events cause hundreds of deaths and thousands of injuries each year? The Center of Disease Control recommends having a kit ready in preparation for any emergency that may arise. They recommend the kit include food, water, flash light, extra batteries, medications, first aid kit, sanitation and personal hygiene items, copies of personal documents, and other necessities. So many people are not ready for an emergency! Energizer Champions for Kids is a great program that helps motivate people to do simple service projects to help keep kids safe! This month they are doing Energizer Light Up A Life and they give you four easy steps to be a Champion for Kids this month. They are Gather, Learn, Give, and Report. You can read more about theEnergizer Light Up a Life Campaign by downloading their Simple Service Project Card! I live in rural upstate New York, and winters are usually pretty heavy duty. We get lots of snow for months and months. We usually use all ten of our allotted snow days and then have to have shortened breaks from school. And we usually have several power outages to go along with it all. So being prepared is a necessity, especially when you have young children depending on you! I have chosen a local outreach program to donate my Energizer Light Up A Life emergency kit to. It is the Sullivan County Pregnancy Support Center, and I love that this organization continues to reach out and provide services to families even after a baby is born. Yesterday I stopped in and chatted with the volunteers at the Sullivan County Pregnancy Support Center about the #EnergizerCFK #CBias campaign and asked what they thought about it. They were excited about having an emergency kit to hand out, as often when a family is struggling financially the last thing they are thinking about is making sure to purchase extra supplies “just in case”. They also responded that despite and unusually mild winter, emergency kits are great to have on hand as last summer and fall left our local communities struggling with major flooding and widespread power outages after a severe tropical storm season. So I am incredibly excited to put together and emergency kit and donate it to the Pregnancy Support Center! But it will benefit only one local family. Won’t you consider checking out the Twitter and making a kit of your own to donate to a local organization? Let’s spread the word and make an effort to start and epidemic of giving to help children in communities across the nation! Be sure to support Energizer for their efforts to do good! Check out their website, Energizer on Twitter and on Facebook! This shop has been compensated as part of a social shopper insights study for Facebook. All opinions and experiences expressed are my own. Sounds like a great organization for your donation! I went to high school and college in upstate NY. I remember those winters well! This will really come in handy in your area!